Grey mist drifts from water to land, blurring the edges of trees, grasses and buildings. It creeps softly down, down, down, blurring first the edges of the hills, then the dark evergreens and the grasses. A few persistent blades of sunlight turn the cattails in the bog to gold. Mid-afternoon, while walking, we watched wisps of grey with patches of sunlight turn to solid grey. To know that the sun is shining beyond, illuminating through the fog, is beauty. Linking to Sunlit Sunday, hosted by Karen of My Little Home and Garden, and to Mosaic Monday, hosted by Mary of the Little Red House. These are beautiful. I love taking pictures on foggy days. Such graceful photos, and you captured the sense of sun in the fog so well. I hope you have a great week ahead! Your description of moving mass of grey is poetic, Lorrie, and I can picture it creeping along. Do you know the Carl Sandburg poem, entitled "Fog"? The second photo is stunning with the greens in the background, the golden tones and the striking red branches, all (as you said) illuminated through the fog. What a beautiful walk it must have been. I love all the colors in the grasses against the grey sky. Enjoy the week and I hope you see some sunshine! The gold and burnt-orange colors dazzle me! Glory to God! Beautifully written and fabulous photos. It's so good to know the sun is still there during the foggy, grey times isn't it? A lovely scene and the ducks do not mind the fog. Lovely mosaic and photos. Have a happy week! Our Sunday was a deluge! I love these pictures. You captured the mood perfectly. Have a lovely day. I LOVE this contrast of gray, foggy sky with the glow of the gold grasses and cattails! So pretty! The mallards are lovely and colorful amidst the winter colors, as well. Have a great day, Lorrie! Beautiful! It looks like you had a wonderful walk. We occasionally get foggy low clouds here, and it leaves the forest covered in glittering frost. Stay warm & happy, Lorrie! Lovely shots of the fog dancing through the tree line! The sun was shining brightly on Pondside all weekend. Very strange phenomenon! We heard there was fog closer to the coast...but we enjoyed brilliant sunshine here all weekend. Beautiful photos! Beautiful pictures Lorrie! I love the colours of the grasses and trees. Light is everything, isn't it? This is such a warm golden light - a nice contrast to the grey fog. Love these. I love photos of the mist and fog. This is beautiful! Love how the sun turns the grasses and cattails golden. Thank you for visiting me and your sweet comment. 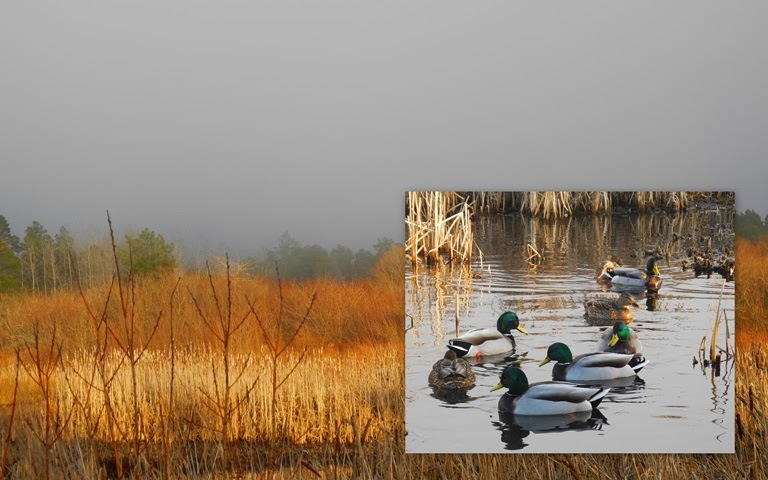 Lorrie, your beautiful images today of this foggy landscape closely resemble my own surroundings! Lovely contrast of the gold grasses and the grey gathering of mist and fog above, smudging the lines between them. Enjoyed your quiet narrative, so fitting for the mood of your photos. Great walk when you can capture lovely pictures like these along the way. The mist looks like it is making. Its way. Sometimes the mist is so heavy in PEI you can feel it fall on you as you walk. These are very beautiful, love the way you caught the sun in its move across the land!